Was - Did I kill my starter, ...? - Now - Please help me with my timing belt... - Miata Turbo Forum - Boost cars, acquire cats. Hi after I redid my coolant reroute and changed fluids I stated my car today. Started well, then stumbled and won't start again. The loose sensor wire of my oil temp gauge might have hit my starter. Now the car sounds a bit strange - like a wirring sound and doesn't start. Did I kill my starter or maybe? Last edited by Zaphod; 03-24-2012 at 09:08 AM. Reason: HEEEEELP! Shouldn't of killed it. I grounded my socket wrench directly to the power bolt a number of times, that's always the point in engine removal that I remember to disconnect the battery. Mine's been fine, 120,000 miles and still starting strong. If the car is cranking then your starter is fine. I would look elsewhere. I suspect something I can't really believe - could the cam belt be gone? Last edited by curly; 03-22-2012 at 03:09 PM. I fucked up your tube link, but it didn't work to begin with anyways. ----. Looks like no cam signal? 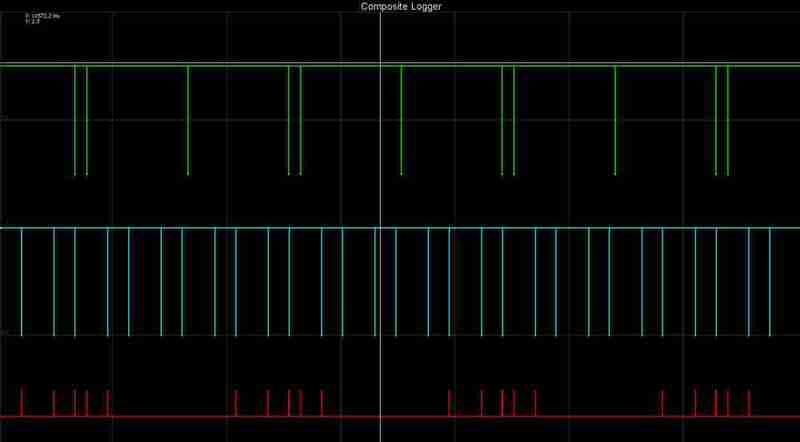 What does the composite logger report? MS Labs: Plug and Play Megasquirt ECUs for ANY 90-05 Miata (NA, NB1, NB2 w/VVT, MSM), including basemaps to get you started ASAP. PM me or email or details. For support on MS Labs ECUs: Please email, be sure to include the unit's serial number and include a datalog and your current map. Gonna look tomorrow... After the reflash. If the engine is turning over really fast, it means no compression. 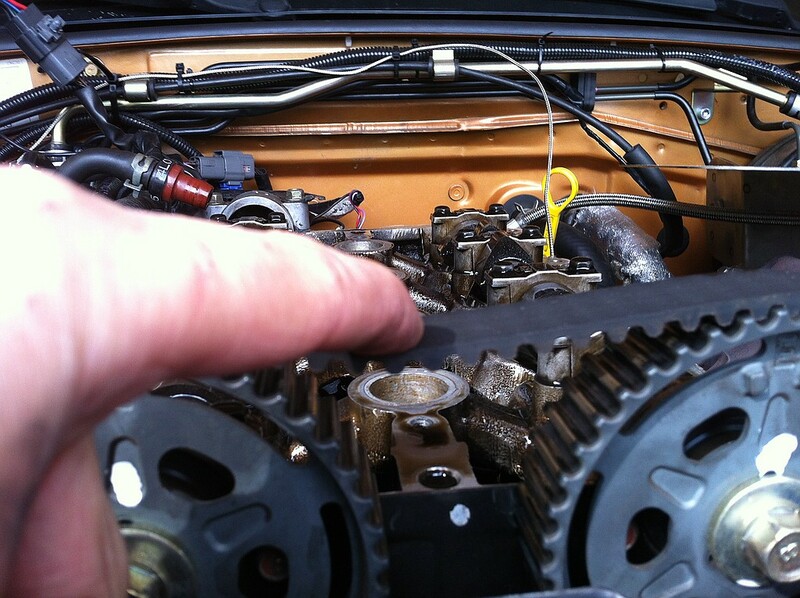 I stongly suspect you've broken your timing belt. Pull your valve cover. It will tell the tale. Fortunately, the Miata engine is non-interference, so this is actually not a big deal. Location: Central Florida, Land of the Giant Rat. No compression, no valvetrain friction. No cam-drive! I am going to pull the Cam-cover this afternoon. You might as well tak a peek through the oil cap. Not enough data in there, you need to crank more. However, the crank sensor signal does appear a bit odd. I pulled the cam cover to have a look at the CAM belt - looks fine - though it seems to have some slack. Could you have a look if the timing marks and teeth between do look correct? @Reverant - to get a longer logfile I will have to re-attach the cam cover. I pulled a COP before I pulled the cam cover - there is no spark. The MS3 is working - verified on the bench/stim. BTW - what does the red line mean? Last edited by Zaphod; 03-23-2012 at 11:03 AM. 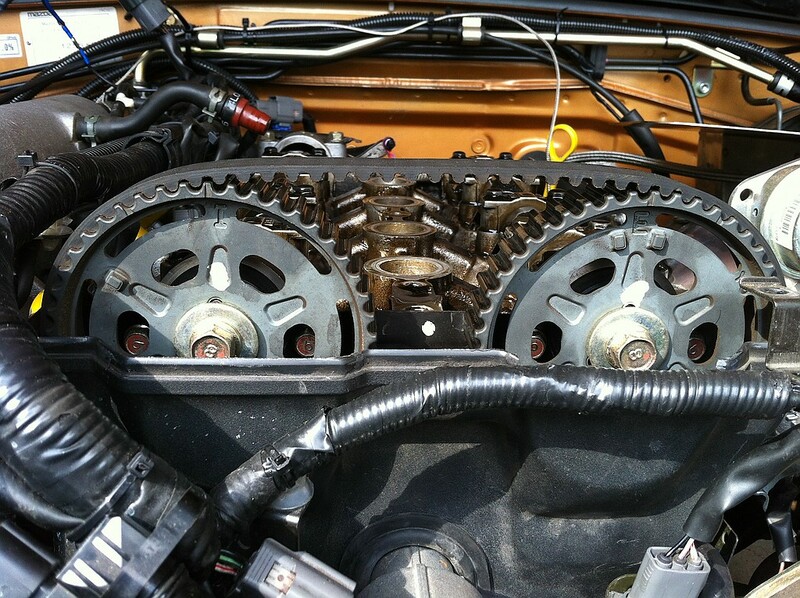 If both cam gears look properly aligned, then it looks like the crank pulley has jumped instead. 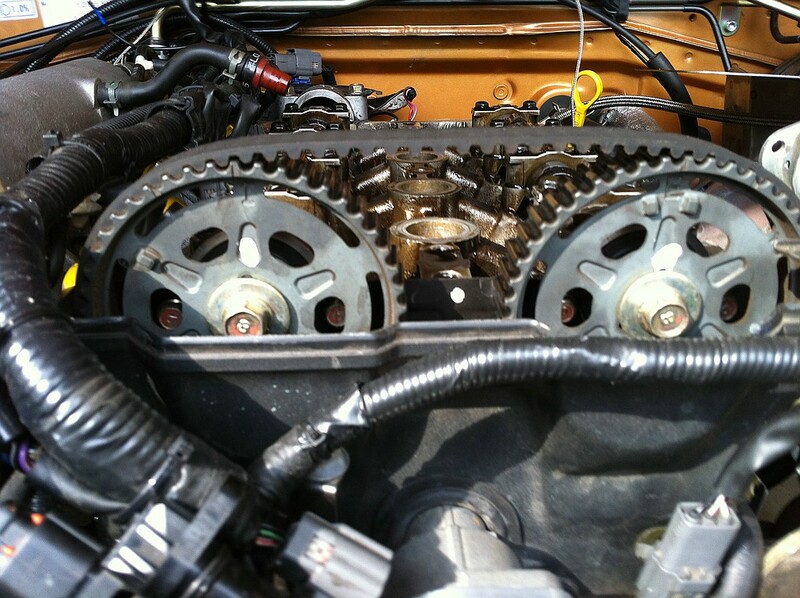 All 4 teeth on the crank pulley should be fully contained between the 1 and 2 teeth on the cam gear. On your log, one of the crank teeth is between the two teeth of the cam gear. This means a complete belt job I suppose...? !